In this CoinDesk 2016 in Review special feature, CoinDesk contributor Frederick Reese gives an overview of trends in the digital currency and digital asset markets. 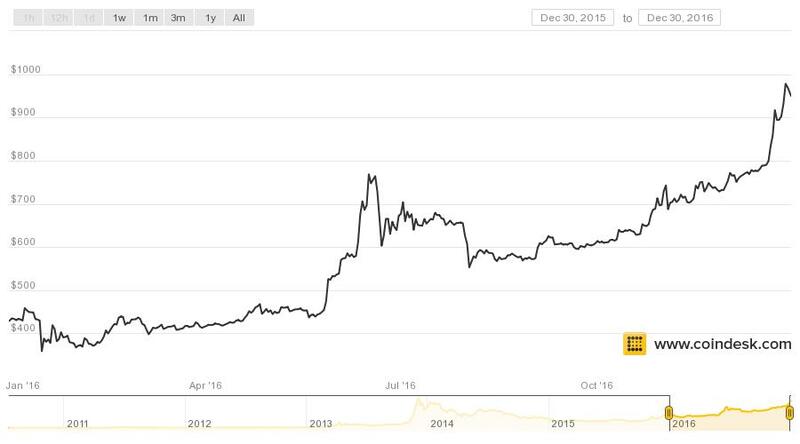 2016 has been an exciting year for cryptocurrencies. 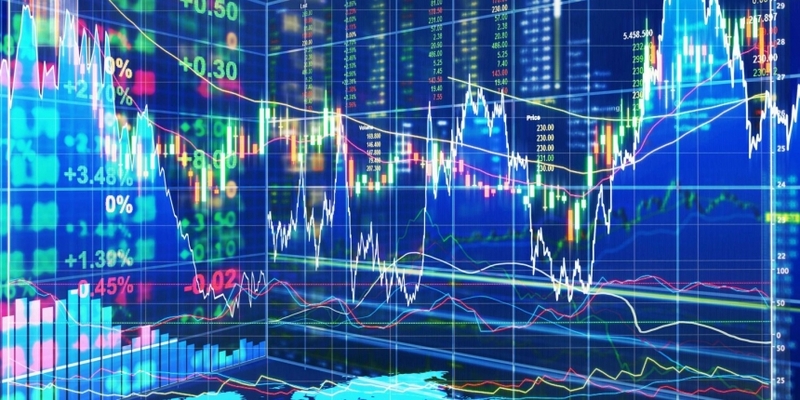 With most of the major open-source currencies showing growth this year and with some expected to see significant expansion in 2017, 2016 reflects a loss of faith in traditional money systems in light of the global populism trend and a growing confidence in the underlying technologies in play for crypto transactions. As the year comes to an end, CoinDesk took a moment to look at the best-performing cryptocurrencies by market capitalization for the year and the factors that affected the markets throughout the year. For the sake of this analysis, we are looking at a review period of December 27, 2015 to December 26, 2016. In 2016, bitcoin remained the king of cryptocurrencies. The world’s oldest blockchain-based asset proved to be a “little engine that could,” booming dependably in times of macroeconomic uncertainty. While bitcoin failed to reach a new all-time high, the digital currency still rebounded from a low of under $400 to achieve an almost three-year high of $982.87 on 29th December. As of the writing of this article, the price was still at the upper end of the year’s range, exceeding $950 per bitcoin. Though shallow markets could also be a factor, bitcoin prices and trading volume were supported by an extraordinary set of global circumstances (at least, according to analysts and investors). These included the devaluation of the Chinese yuan, the UK’s decision to leave the EU, and the unpredictability of a Donald Trump presidency. Yet, despite this, bitcoin remained in the middle of the pack by metrics such as year-to-date valuation change and toward the bottom in terms change in market capitalization by percentage. However, bitcoin’s large valuation arguably makes its positive growth more significant to the global investment community. Still, most of the trading activity remains centered in Asia, as Chinese trading volume continued to exceeded US trading volume by significant multitudes. 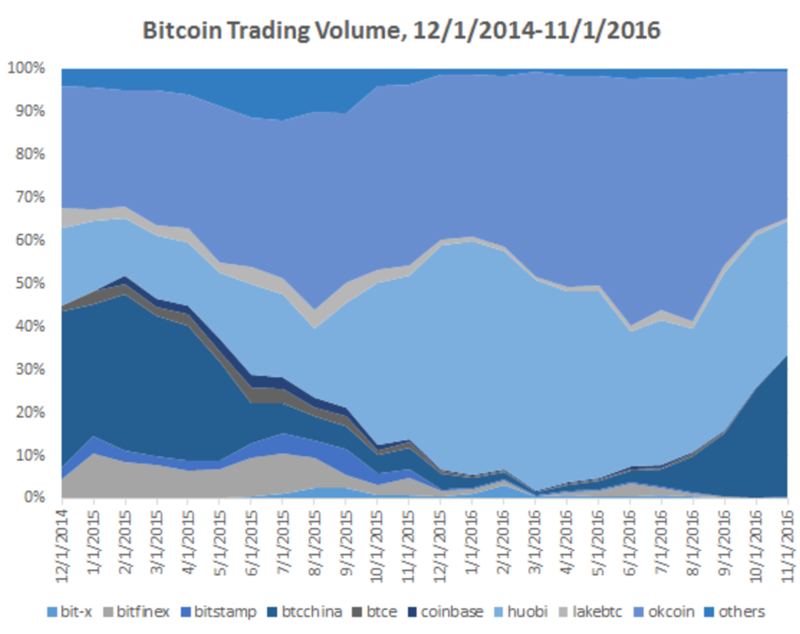 As seen above, some of the largest Chinese miners and exchanges – OKCoin, Huobi, BTCC, Bitfinex and LakeBTC – dominated global bitcoin trading this year. The drop in the yuan may be the reason for all this activity, however, with reports of the Chinese government exploring ways to resolve the obvious bypassing of its capital controls, the local scene may eventually become more subdued. 2016 saw ether – the cryptocurrency that powers the ethereum network – become one of the world’s best-performing currencies, despite a well-publicized hack. With a more than 2,000% increase over the first six months of the year and a nearly 300% increase for the calendar year, the pioneering blockchain for decentralized applications suffered from high volatility, perhaps due to its relative newcomer status. The most significant factors in the instability of the ether price were the DAO hack, the subsequent collapse of the autonomous organization, and the creation of ethereum classic. These actions, occuring in June and July, saw an erosion of nearly 50% of the altcoin’s worth in less than two days. It’s important to understand what affect the creation of ethereum classic had on ethereum (see above image). While valuation recovered to a certain degree, the successive forking of the blockchain led to a steady decline in prices. However, as ethereum is currently being seen as the preferred network for possible FinTech permissioned distributed ledgers, enterprise software and Internet of Things applications, 2017 could show a capitalization increase for ether. To begin with, it’s important to recognize the clear the distinction between an open blockchain asset such as bitcoin, and one that operates on a permissioned ledger overseen by a private company, like Ripple’s XRP token. Yet, seeing where this upstart lies on the cryptocurrency map helps to understand what happened in other markets this year. Serving as an intermediary for instantaneously converting one currency to another, there are no retailers that accept XRP. Despite this – and maybe because of the potential XRP has for regulated cross-border commerce – Ripple did show significant potential for growth and currently has the second highest market capitalization among publicly traded cryptocurrencies. Despite this, XRP ended this year close to its opening price, though it did see some noteworthy volatility along the way. The largest spike came in September following investments from major financial firms such as Standard Chartered and Siam Capital. One of the oldest of the bitcoin alternatives, litecoin showed one of the more stable valuation curves for 2016. Closing more than $2 above its starting price for the year, litecoin showed gradual but steady growth in value. This was disturbed, however, by two events. In June, litecoin saw its upward spike – which was fueled by the recovery in valuation from the altcoin’s 2015 reward halving and by the lowering of mining difficulty – grow significantly in response to the Brexit vote. This, as with bitcoin and most of the world’s fiat currencies, led to the strengthening of the US dollar’s value against the litecoin and caused a significant price drop. Then, in August, VC-backed startup Coinbase added litecoin to GDAX for dollar trading, which cause a temporary spike in pricing. As far as market capitalization growth as a percentage goes, monero is far and away alone in the pack. With a monetization that went from $4.7m at the beginning of our observation period to a high of nearly $168m, monero made skeptics of this non-bitcoin derivative eat their words and rethink their portfolios. The primary reason for monero’s rapid valuation increase was its adoption as a preferred currency by the DarkNet market AlphaBay. While this brings up the ghosts of bitcoin’s use in dark markets, the exposure served to help mainstream the formerly obscure altcoin. This was followed by the currency’s adoption by Oasis Market, another DarkNet marketplace, and by extensive coverage by Vice, ZDNet and others. However, as monero pricing is subject to the same hype market that affects other cryptocurrencies, the price spike collapsed in the post-summer cool down, only to ratchet up again following news of Donald Trump’s election win. If XMR represented the highest percent of annual growth for 2016, classic ether represents the highest percentage of price loss for the year. The result of a hard fork to refund the out-of-pocket token holders of The DAO after the 18th June hack, ethereum classic (ETC) formed due to a split in the ethereum community in which some felt that “code is law”, the blockchain is immutable and that any attempt to correct a “permitted” action defies the purpose and value of the blockchain. The controversial split created a high amount of enthusiasm amongst some traders, which saw classic ether’s prices climb well above $2 and 24-hour trade volume to over $133m at its highest. The 24-hour trade volume at the end of our observation period is less than $750,000, with a low of about $205,000 on 20th November, as per CoinMarketCap. The notion of a double blockchain has always been a troubling and something bitcoin has desperately sought to avoid, as having two competing, identical blockchain could possibly erode confidence in one or both. It would seem that this is exactly what happened with ethereum classic – as ethereum rose, ethereum classic sank. However, there is some light at the end of this tunnel: classic has made as much as a 37% comeback in December, due to aggressive trading by the Chinese altcoin community. With a spike in hashrate, it is likely that this uptick may be part of a long-term trend. This rebranding seemed to work. Dash ended its year with pricing nearly three times, and a market capitalization close to four times, where they started the year. Powered by its Darksend system, transactions are virtually untraceable on the Dash network, making Dash and its Masternodes’ batch-processing of transactions a preferred choice for anonymity-seekers. It’s important to note, however, that Dash still has its fair share of vocal detractors, so the verdict is still out on its potential. As we enter 2017, the future for the cryptocurrency market is looking bright. 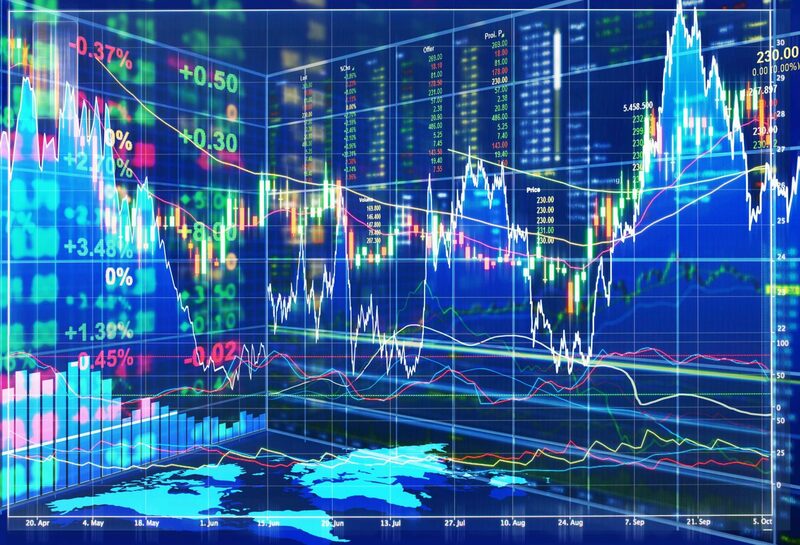 While some digital currencies, like bitcoin, may hit new highs, and others, like ethereum and ethereum classic, will fight for position, the digital currency/digital asset market will continue to progress and prove its worth as one of the top-performing commodities available today. At the same time, innovations in blockchain interactions, FinTech integration and anonymity-assurance will make cryptocurrencies in 2017 closer to the ideal imagined by Satoshi Nakamoto and the early pioneers of the technology. Correction: An earlier version of this article incorrectly stated the date darkcoin rebranding as Dash.